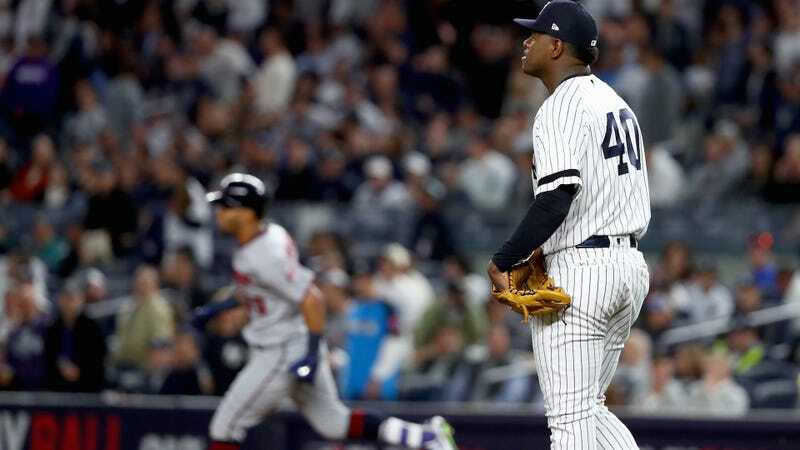 Luis Severino has been the best part of the Yankees’ rotation this year, leading the team’s starters in ERA (2.98) and FIP (3.07) and strikeout rate (10.71 per nine innings). He’s forced more ground balls than almost anyone else (more than half of his contact) and allowed fewer home runs (fewer than one per nine innings). Tonight, in his start against the Twins in the AL wild card game, none of that was on display. That was followed by an Eduardo Escobar single and a Max Kepler double, which was followed in turn by manager Joe Girardi mercifully giving Severino the hook and pulling him for Chad Green, who struck out two to end the inning. But luckily for Severino, his counterpart for the Twins was Ervin Santana, whose performance was almost just as bad. Santana labored through a 42-pitch inning, highlighted by a game-tying home run from Didi Gregorius after walking Brett Gardner and allowing an Aaron Judge single. (Santana got the chance to finish the inning, and it looks like he’ll head out for the next one.) That’s a 3-3 game, after one inning of play that lasted nearly an hour. Playoff baseball—it’s here, baby!! !